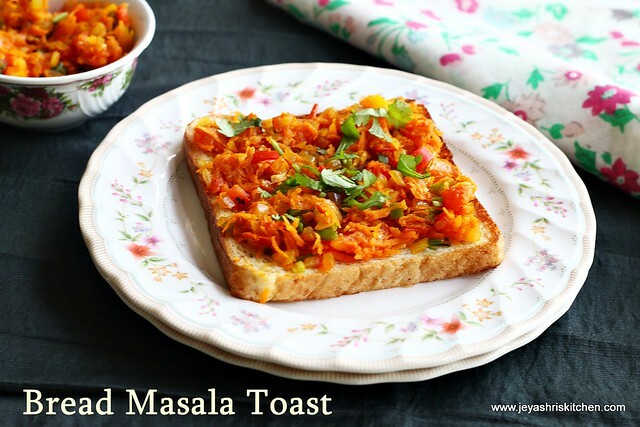 Bread masala toast is a open sandwich, which can be made on busy mornings for breakfast and also if you want a light dinner too. I wanted to post a sandwich recipe without using a sandwich maker, and so posting this recipe. 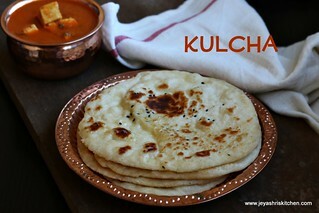 This can be made on a tawa and quite easy one to make too. 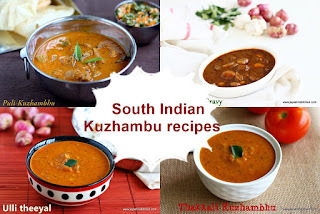 I got this recipe idea from here. 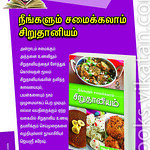 A best tiffin for kids who come back from school and with veggies in it, quite healthy too. 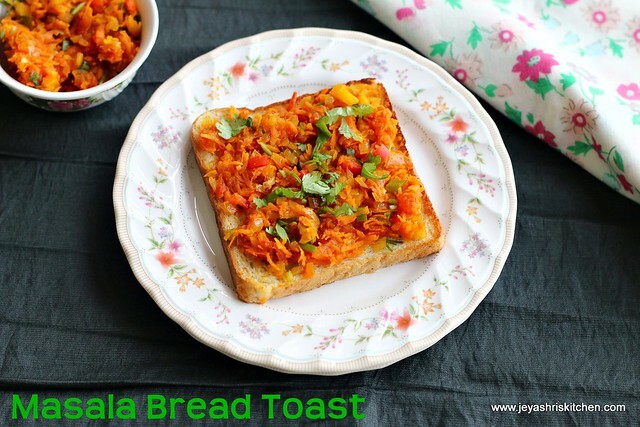 I have given this recipe for Kungumam Thozi supplement 2 months back.I made this bread masala toast again and clicked stepwise pictures to post it here. 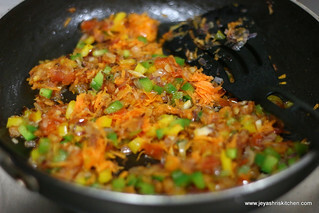 Grate the carrots and cut the onion , tomato (deseed the tomato) and capsicum into very fine pieces. 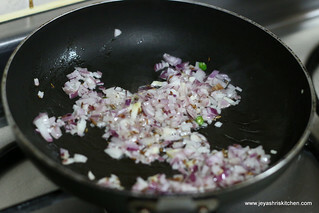 In a pan add oil and add in the cumin seeds and add the onions and saute till they turn pink. 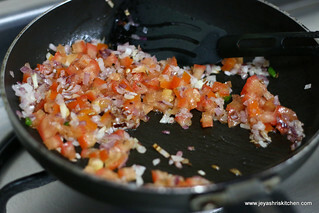 Add in the chopped tomatoes and saute well. 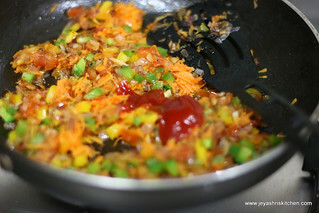 Add in the grated carrots and the bell pepper. 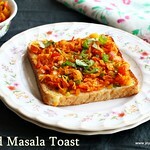 Stir it once and add the chaat masala,red chilli powder and the the tomato ketchup. Add salt and mix well. Saute in a low flame for 5 minutes. Switch it off . 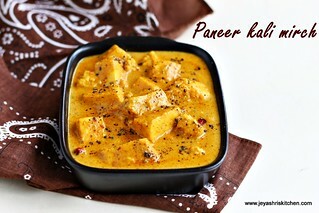 Place a tawa and heat it. 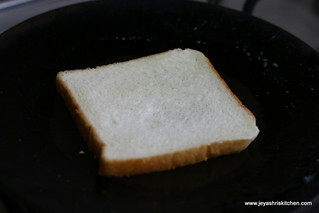 Toast the bread with little butter on both sides. 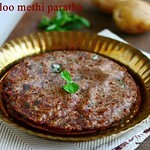 Spread the filling on the top side and garnish with coriander leaves. Repeat the same for the rest of the bread too. You can add cooked grean peas too. Any veggies of your choice can be added. 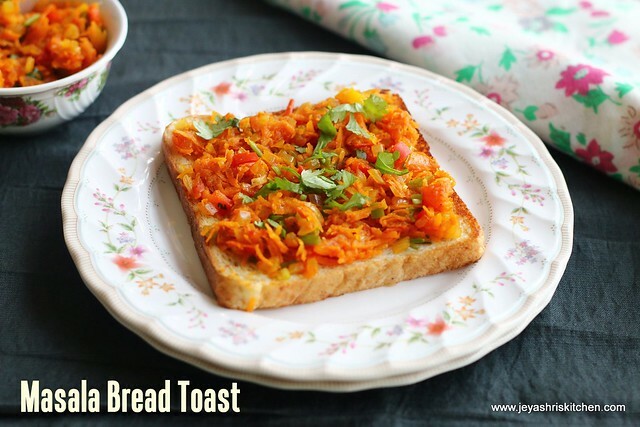 You can either serve this as an open sandwich or serve as a closed sandwich by keeping another toasted bread on it. 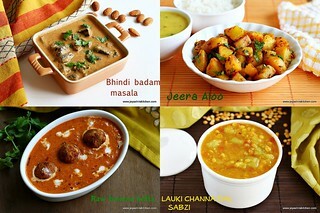 Left over potato curry or poori masala can be used as filling. 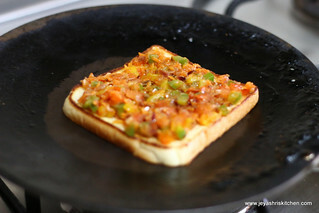 Love these open sandwiches, as you said, nice way of sneaking in veggies for the kids..
yummy toast.. perfect for snack.. Ooooooh!!! 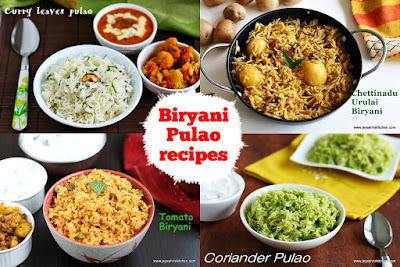 I have had these in Iyengar bakery... Yours look excellent!! 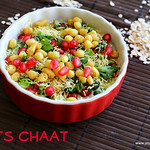 yummy snack for quick preparation!!! 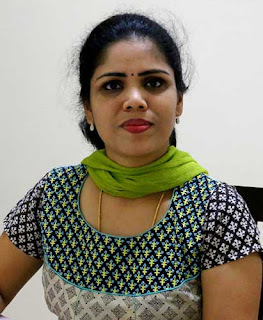 sooper delicious .. bakery style..